Some people say the hitch is an over-kill for a smaller trailer. 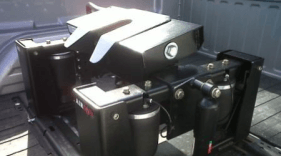 The design of the Omni-Directional hitch allows you to get all of the benefits no matter what your Trailer Pin Weight is by just adjusting the amount of air in the hitch to meet your trailer Pin Weight. If you trade trailers or trucks, just add or release air for the new Pin Weight. Our four air bag hitch is designed to allow the hitch head to move on the air bags in any direction, based on articulation from the trailer itself. The result of such continuous motion results in a smooth ride and decreased chucking and surging forces from the trailer or the truck. In addition to the movement from the trailer, the 4 airbag hitch supports 100% of the pin weight, increasing the effectiveness of the air springs. NEW: We offer an exclusive AirSafe adapter for the Ford, Chevrolet/GMC, and Dodge Ram and Underbed systems. 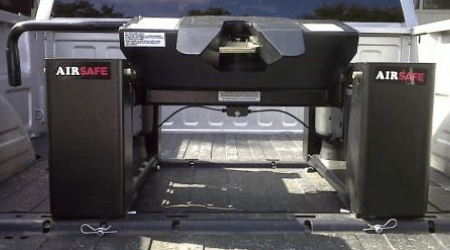 Our Air Safe (AirSafe) 20K hitch is designed to prevent the extreme force that takes place between the trailer and the hitch when you put the brakes on. These uniquely designed hitches were created with world-recognized Solid Works engineering software. The connection between the trailer and the tow vehicle is separated by air bags constructed of industrial strength material. The 20K hitch is a 5th wheel hitch designed for heavy-duty towing jobs. Our maintenance-free Omni-Directional system features four air bags located in the towers of the hitch. After you have connected your trailer to the Air Safe 20K hitch, simply inflate the air bags to the recommended ride height. 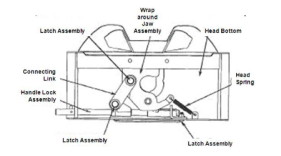 If you lose pressure in the air bags for any reason, the Air-Ride hitch will become a hard connection and will not result in the loss of the trailer from the tow vehicle. 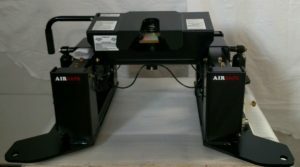 Our Air Safe hitches provide a unique experience to the driver of a tow vehicle by decreasing exhaustion at the end of the trip and making large tow jobs more enjoyable. Because there is less friction between the hitch and the trailer, the tow vehicle is able to operate at a lower strain rate, thus easing wear and tear on the transmission and the suspension. Air Safe 20K hitches are equipped with four heavy-duty springs in the corners of the device. These springs reduce the shock transfer from the trailer to the tow vehicle by 90 percent. The Omni-Directional system permits smooth motion from front to back, side to side and corner to corner to achieve maximum shock absorption and the greatest possible amount of control for the driver. Two more industrial-strength shocks on the side of each tower discourage oscillation. You can watch our online videos to see how the energy is transferred from the front to the back of the hitch in a smooth and even motion during acceleration and braking. Bumps, curves, hills and potholes are not hindrances to control with the Air Safe 20K hitch. Call now to order the hitch that helps you both enjoy your ride and arrive at your destination alive in a calm frame of mind.